Are you Looking for the Ultimate Spa Experience in Your Very Own Home? This uniquely designed bath tray keeps all your bath items and accessories within arms reach on a safe and secure platform that fits in tub perfectly. Imagine yourself in a hot, relaxing bath while watching enjoying your favorite movie or book. It has never been easier to drink a glass of wine while you unwind and let your body ease from stress and tension after a long hard day. ✓ Premium Quality Materials - Using the finest quality eco friendly bamboo available for added durability and longevity. You won't find another caddy available on the market stained with contemporary Walnut Brown to compliment your bathroom. ✓ Simple Storage - Conveniently folds ups after use so it takes up little space in your bathroom. ✓ Easy Reading and Viewing - Our stainless steel reading rack can be adjustable in 3 position to help you find your ideal viewing angle for your book, magazine, e reader or tablet. ✓ Compatible with Any Tub - Whether you have a conventional, clawfoot, freestanding tub or jacuzzi our caddy will easily fit with our adjustable sides. ✓ 100% Customer Satisfaction - Here at Bath of Eden, we proudly stand behind our product we are sure you wouldn't want to return it. Get in touch with our Customer Service team if you have any issues, we are here to help. LIMITED QUANTITIES AVAILABLE, DON'T MISS OUT! CLICK ADD TO CART NOW to Indulge Yourself or a Loved One in Luxury, Comfort and Relaxation from Convenience of Your Home! BUILT TO LAST - Made from 100% Natural, Sustainable, Eco-Friendly and Water Resistant Bamboo Wood. Our Premium Walnut Brown finish along with our eye catching design make this the perfect additional to your bathroom. RELAX IN STYLE AND COMFORT- Contains a built in cup holder for your favorite glass of wine, soothing cup of tea or coffee. 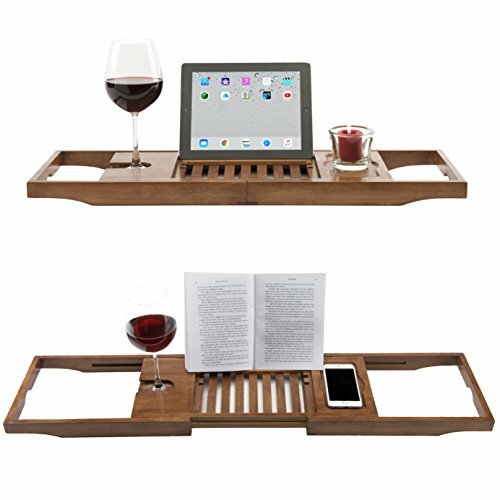 Specially designed for you to enjoy your desired book or movie while you soak and unwind. SAFE AND SECURE DESIGN - Our adjustable book holder is covered with special waterproof cloth to prevent your book, phone or tablet from falling into your tub. Your items will be nice and safe; right when you need them to give you a luxury spa like experience in your very own home. EASILY ADJUSTABLE - Uniquely designed to fit most bathtubs or jacuzzi's available on the market. Measures 27 ½ Inches closed and extends out to 41 Inches. It comes ready made right out of the box so you can use this right away to indulge yourself in a nice long bath. 100% MONEY BACK GUARANTEE - Love your bath caddy or your money back. The perfect gift idea for a Birthday Present, Christmas or Anniversary Gift for a friend or a loved one. You can try us RISK FREE today. CLICK ADD TO CART now! If you have any questions about this product by Eden Bath, contact us by completing and submitting the form below. If you are looking for a specif part number, please include it with your message.